Just south of Seattle, Mason County is blessed with miles of pristine Puget Sound shoreline, but with limited public access. In March 2012, working with Capitol Land Trust, Taylor Shellfish Company, People For Puget Sound, and the County, The Trust for Public Land transformed 1,500 feet of private waterfront property, known as Sunset Bluff, into a much-needed public park. The 36-acre property also includes impressive uplands with stunning views of the Olympic Mountains and great potential for wooded trails and picnic areas. The conservation and restoration of this natural area will do more than allow the community to enjoy a shoreline they could previously only see through the trees. It will help protect the waters that feed into Oakland Bay, a bay with an economy dependent on clean water. 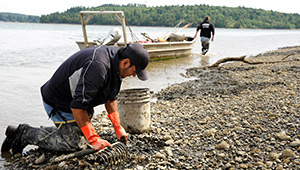 Tribal, recreational and commercial shellfish harvesters find their clams and oysters here; some of which are distributed throughout the nation.